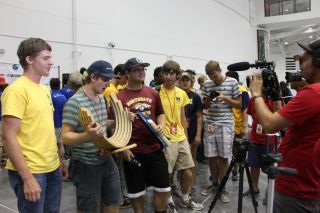 A team from the University of Michigan took home the first Spaceport America Cup in a competition with more than 100 student rocketry teams in New Mexico. A student team from the University of Michigan, Ann Arbor, took top honors last weekend at the 2017 Spaceport America Cup in New Mexico. "The cup is just incredible," said Daniel Hicks, CEO of Spaceport America, in a phone interview with Space.com on Friday (June 23) from the competition site. "We've been looking forward to it all year long. The excitement in their [the students'] faces as they get ready to compete is amazing. Each student has been working on these rockets for over a year, getting ready for this event." Speaking briefly by phone from the launch area on Friday, Matthew Ellengold, president of co-organizer the Experimental Sounding Rocket Association (ESRA), said events had been going smoothly for the 110 teams on site. "I've been so busy running around that I don't get an opportunity to sit back and appreciate the magnitude of it until it's all said and done," Ellengold added. This was the inaugural year of the Spaceport America Cup, but it is a new iteration of ESRA's International Rocket Engineering Competition. After 11 years of operations, the final ESRA cup was held in 2016 in Green River, Utah, with 40 teams. The 53-foot-tall Future Heavy sport rocket lifts off from Spaceport America in New Mexico on June 24, 2017. The rocket was designed, built and launched by United Launch Alliance (ULA) interns and mentors and is the largest sport rocket launched in the world.